Those present at the 1938 game remember it as being one of the best they had ever seen. Even as the players moved on to college, got jobs and raised their families, the big game still lingered in the back of their minds. Fifty years after the game, former Colfax resident turned movie star, John Crawford, was among a group of residents rallying the Colfax community and Bulldog alumni to memorialize the game by holding a 1988 rematch. The game was played at Colfax High, but this time the outcome was different. The Colfax Bulldogs earned their payback, beating the St. John Eagles with a score if 6 - 0. The "Codger Bowl," as it became known, was unlike any other event to have taken place in the region. Many Colfax residents felt that the uniqueness of the game was, in and of itself, worthy of remembrance. 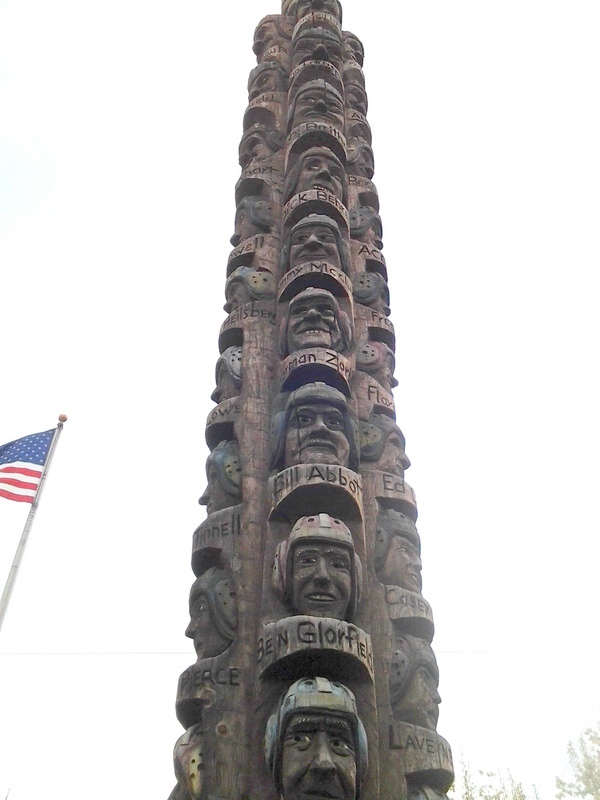 In 1991, John LaBenne from Idyllwild, California was the artist chosen to commemorate the event, which he did by using a chainsaw to expertly carve the faces of all 51 players into five, 65-foot tall cedar poles. Each player even has their original leather football helmets and wrinkled, aged faces added to the detail. Every face is meticulously cut, including their last names and jersey numbers. LaBenne agreed to do the carving for a $10,000 donation, of which, only $960 has yet been paid to the artist. It took four-months to complete and he sunk $5,000 of his money into it, expecting to receive the originally agreed upon sum. The dejected LaBenne still harbors resentment against both the piece and the City of Colfax. In a 1988 interview, he stated that the experience was the "lowest moment" in his life and that, had his car worked, he would have "gone back and set a match to it." LaBenne did a wonderful job in portraying the Colfax and St. John players with his sculpture and his art continues to stand as a monument to the importance of not just the 1938 game, but to the importance of Palouse football period. 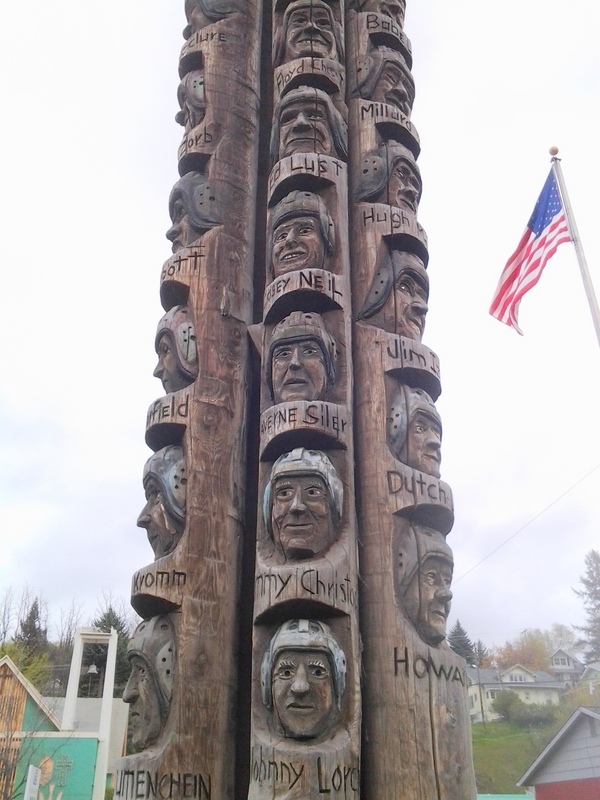 Codger Pole, Colfax, WA: The Codger Pole is made up of five individual cedar poles, each with ten players carved into it, except for one pole, which has eleven faces. Photo by author, 2014. 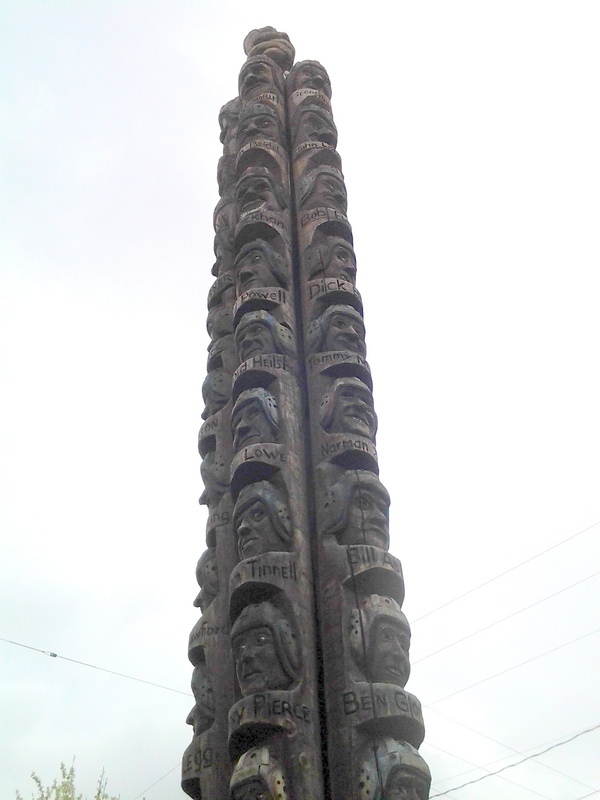 Codger Pole, 2014: Each of the 51 faces are very well-detailed. Artist John LaBenne spared no expense to make sure that every player was represented individually. Its the little things, the smallest, most minute details, such as the wrinkles, which really make this work of art stand out. Photo by author, 2014. Codger Pole at Schmuck Park, 2014: The Codger Pole was erected and dedicated in Schmuck Park in the North End of Colfax. Schmuck Park is one of the most popular public parks in town and has a skate park and a swimming pool. Photo by author, 2014. Tallest Chainsaw Sculpture in the World, 2014: The Codger Pole has the honor of being the tallest piece of chainsaw artwork on the planet. The 65-foot high poles are a must see, even of you are simply driving through Colfax. Photo by author, 2014. The Codger's Wooden "Heisman? ": Atop the 65-foot tall sculpture sits a small, 3-foot tall football player, dressed in the uniform that the 1988 codgers would have worn in the original 1938 game (including the thin leather helmet and very little padding). The figure stands in an almost Heisman trophy-like stance as he looks over downtown Colfax. reminding the town of the Bulldog Codger's victory over one time rivals St. John. Photo by author, 2014. 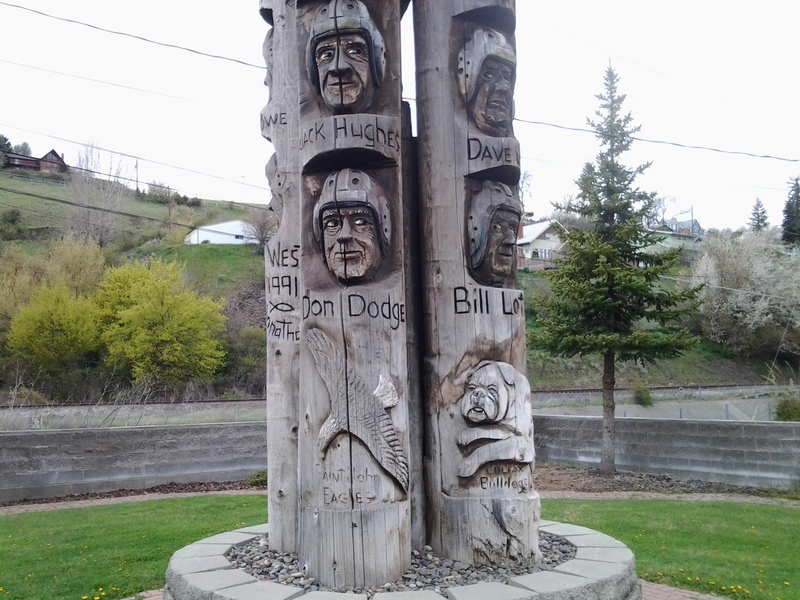 Foot of the Sculpture: Besides displaying just the names and faces of the 1988 codgers, the pole also has engraved on it the mascots of the two schools - the St. John Eagle and the Colfax Bulldog. Photo by author, 2014. 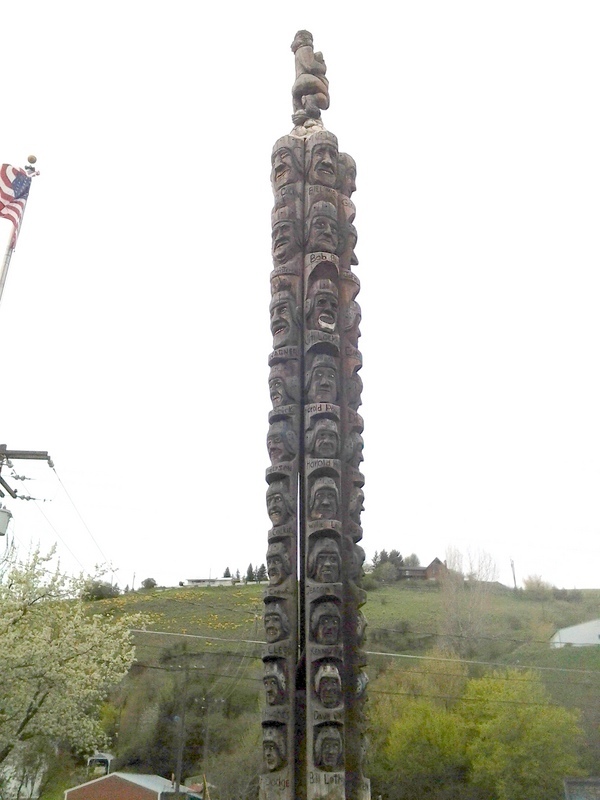 Robert M. Lambeth, “The Codger Pole,” Spokane Historical, accessed April 24, 2019, https://spokanehistorical.org/items/show/435. Doug Clark. 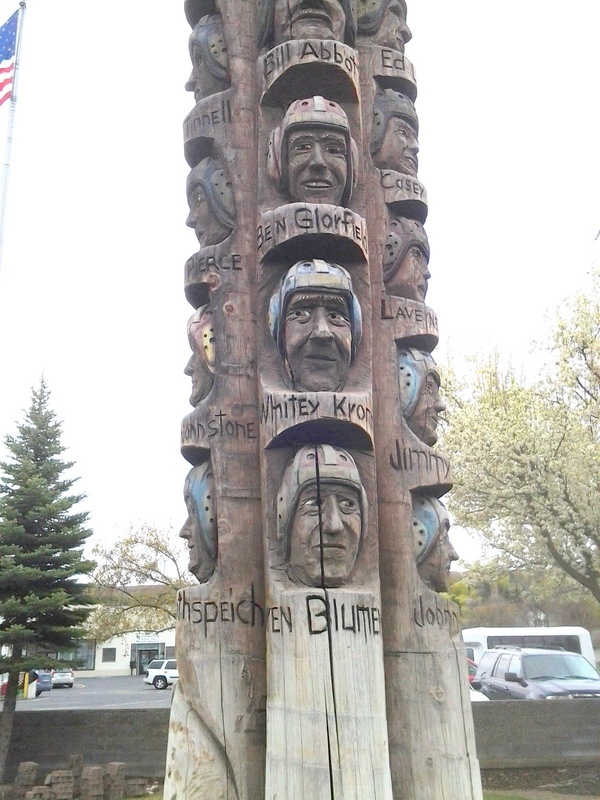 "Colfax gets the Codger Pole, while Sculptor gets the Shaft." Spokane Chronicle, June 23, 1992. Doug Clark. "They'll Settle an Old Score in Codger Bowl." Spokesman-Review, April 26, 1988. Terry Richard. "Codger Pole in Colfax, WA relives 50-year-old Football Glories." Oregonian, August 1, 2012.